Dubai, UAE, August 08, 2018: Adding to its successful Adamavi collection, Carl F. Bucherer is excited to announce nine new additions in three different sizes. The collection’s name is derived from the Latin word adamare, which means “to come to love something” or “to take pleasure in something.” A perfect name for a collection that combines timeless and pure elegance with reliable mechanics. The Adamavi collection has thus gained great popularity among men and women throughout the years. Baselworld 2018. Watchmaking skills, technical innovations, and continuity are what set the 130-year-old family business Carl F. Bucherer apart from the rest of the industry. With its timeless design, the Adamavi collection exhibits a unique philosophy: striving to preserve things of a proven value. This principle is embodied by the classic appearance of the Adamavi family. These watches stand out thanks to their simple, timeless design. Powered by reliable high-quality movements, the value of these timepieces is clear to see, even after many years. This successful and enduring collection is expanding with a total of nine new models, all equipped with mechanical movements. Thanks to their understated design, the watches from the Adamavi family can be worn on any occasion. The versatility of this collection is further underlined by the fact that the Adamavi is available in three different sizes with differently designed dials and a wide variety of straps. 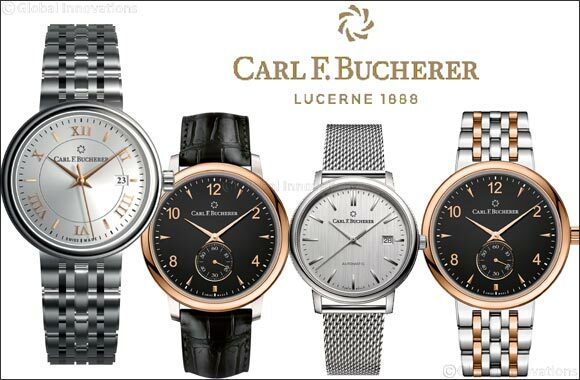 Since Carl F. Bucherer always attaches great value to watchmaking skills, the right movement is used for every size. Two automatic calibers and a hand-wound movement are offered. With a case measuring 39 millimeters in diameter, the Adamavi is valued by men and women alike. A new addition here is the watch housing the CFB 1968 caliber hand-wound movement, boasting a stainless steel case and warm rose gold bezel. The black dial with gold-plated hands, indices, and Arabic numerals underscores its elegance, and the watch can be customized with a black alligator-leather strap or a link bracelet with stainless steel and rose gold elements. Those who prefer a thin design are taken by the new automatic Adamavi, which features a CFB 1950 caliber with a practical date display. Complementing each other tone on tone, steel-colored hands and color-matching indices provide for visual understatement, while a supple Milanese bracelet ensures a high level of comfort for the wearer. Carl F. Bucherer is offering a total of four new timepieces with a stainless steel case in the classic ladies’ size of 31 millimeters. These timepieces utilize the CFB 1963 caliber automatic movement, which also features a date display. Design variety is offered in the dials, which are available with Roman numerals or simple indices, as well as the different straps. Wearers can choose between black alligator-leather straps as well as link and Milanese bracelets made from stainless steel. Women looking for an especially dainty companion on their wrist can opt for the Adamavi with a diameter of 28 millimeters. Just like the large Adamavi, this new timepiece has a stainless steel case with a rose gold bezel, which can be combined with a black alligator-leather strap or a link bracelet with stainless steel and rose gold elements. The Adamavi family thus exhibits great versatility. What all of its members have in common, however, is their timeless value.